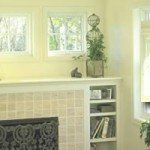 Vinyl Replacement Windows For The Indianapolis Region – High Performance Insulated Glass Systems! 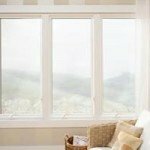 Most window manufacturers utilize the same type of insulated glass in all the windows they produce, regardless of whether the windows are installed in the cold north or the hot south. 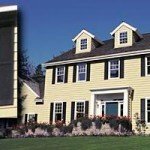 Restorations offers high-performance insulated glass systems, each of which is engineered to provide you the maximum thermal efficiency and comfort in the particular area of the country where you live. All of Restorations’ insulated glass systems are licensed and certified with the NFRC Certification Program. Occasionally, typical insulated glass unit can develop moisture between the panes – an expensive and time-consuming issue to remedy. 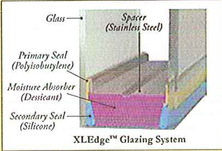 To prevent this, Restorations windows utilize the XLEdge™ Glazing System which features a double-sealed system, (unlike competitors single-seal systems), and a warm edge, structurally sound stainless steel spacer system. This means that, when tested under accelerated weather conditions, Restorations glass systems outlast the competition. 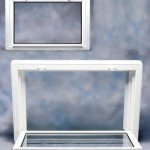 Restorations dual-pane i89 Energy Saver Plus glass system is designed for high performance. The Interior Low-E coating, similar to what is used on premium cell phones and tablets, is scratch resistant, long lasting and reflect your home’s heat back into the room. Superior thermal performance is delivered using an argon-filled cavity and innovative glass coatings The i89 Energy Saver Plus glass outperforms conventional windows to keep your home comfortable at any temperature. Lifetime warranty covers the entire window – including the glass! 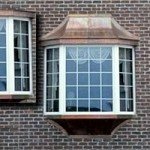 Simply installing a new window into an existing wooden frame isn’t always the best idea, particularly if that frame is old, damaged or decaying. Bee’s B35 Full Frame Replacement System is the solution, giving your home an entire new window opening for your beautiful new window and up to 30% more visible glass as well! Learn more. If you like what you see and you’re ready to get started with Bee, please call us at (317) 283-8522 or schedule a free quote appointment. 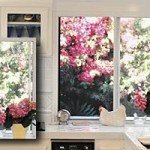 A Bee design consultant will visit your home for a complimentary design consultation and will provide you with a 30-day Low Price Guarantee on the products and installation services to get your home looking wonderful again. 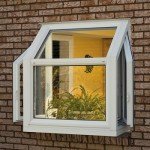 Bee is proud to offer these vinyl replacement window systems throughout Indianapolis and all of Indiana to our customers! 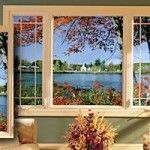 Bee Window proudly serves satisfied vinyl windows customers across all of Indiana, including Fort Wayne, South Bend and Lafayette.